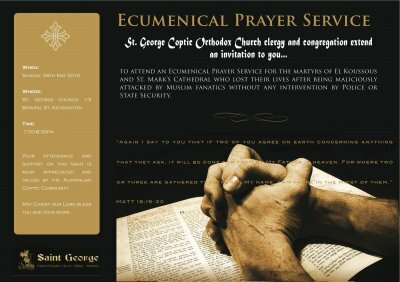 St. George Coptic Orthodox Church clergy and congregation extend an invitation to you to attend an Ecumenical Prayer Service for the martyrs of El Koussous and St. Mark’s Cathedral who lost their lives after being maliciously attacked without any intervention by Police or State Security. Your attendance and support on this night is most appreciated and valued by the Australian Coptic Community. May Christ our Lord bless you all.